Regardless of what kind of database you’re creating – personal, business, etc. – one of the most important things to consider is the security of the database (especially if it’s going to contain super sensitive information like your credit card numbers, banking information, or log in passwords for the various websites you happen to visit regularly). Data Guardian gives you all of the security you need and so much more – You can make phone calls through your modem with a single click, create new email messages, generate secure passwords, create different categories to store your records in, and a whole lot more. If you’re someone that wants to be able to be able to store sensitive information on your system, it’s definitely worth the very small price – Download the free trial onto to see just how much piece of mind one small program can give you. 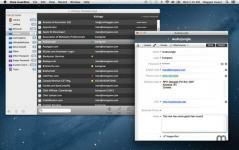 - Allows you to synchronize your databases however and whenever you’d like. - Automatically saves your databases for you so that you can easily find them whenever you need/want to. - Lets you apply changes to multiple records at one time quickly and easily. - Lets you dial phone numbers from your directories quickly and easily using your modem with one simple click. - Gives you the opportunity to import virtually any flat-text file and map it to custom fields as you see fit. - Allows you to export your databases to a flat-text file so that you can easily use them in alternative programs. Please note that this trial version of Data Guardian will only be valid for 15 days and that the program will nag you to download the full version of the program throughout that time.